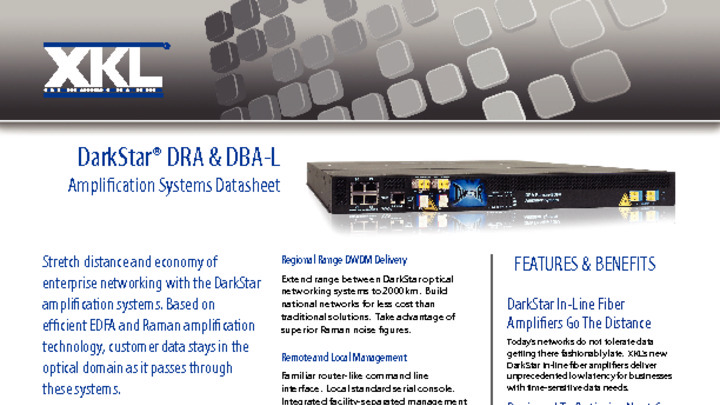 XKL’s DarkStar product line is designed to allow enterprises to easily and cost-effectively build private optical networks with massive bandwidth, giving an alternative to the traditional solution of using expensive carrier services. The benefits of this approach include higher reliability, reduced cost and power and more control over IT resources. DarkStar products are designed to require no optical engineering expertise. XKL accomplishes this by integrating most of the components of a complete fiber optics transmission system into a simple 1RU package. This allows DarkStar products to be nearly “plug and play” systems. The foundation of XKL technology is focused on the high performance and high availability requirements of mission critical applications. The DarkStar products are engineered with hot-swappable cooling and power components and are designed to use relatively little power. This increases the range of operating temperatures for the various products and increases the life of critical components — especially lasers and power supplies.